The Kerry Camino is a fantastic walking trail from the town of Tralee to St James Church in Dingle, in County Kerry, in the South of Ireland. This route follows a section of The Dingle Way, taking a trail believed to have been followed by Saint Brendan, the Navigator, back in 512AD. The route has also been taken by monks and pilgrims on their way to Dingle where they would then board a boat taking them to Northern Spain to continue their Camino de Santiago journey on foot. 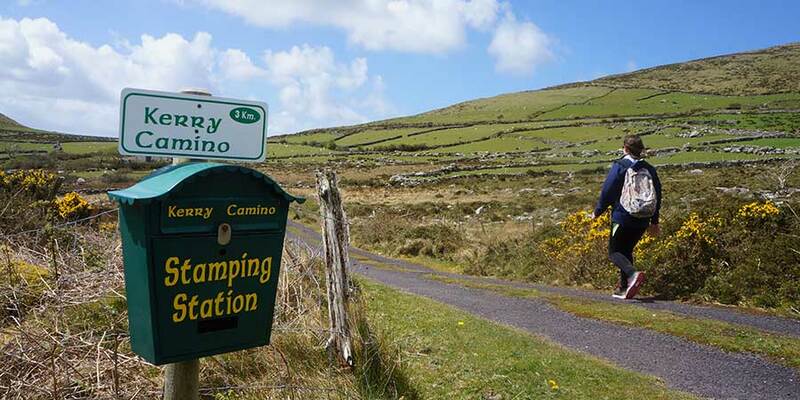 The Kerry Camino is run by a group of enthusiastic locals, keen to recover the history of this beautiful trail. The team has created a log book where walkers can collect stamps along the way and record their progress. At CaminoWays.com we are proud supporters of the Kerry Camino Festival and our team takes part in this great event every year. In 2019 the Kerry Camino Festival takes place from Friday 3rd – Sunday 5th May and everybody is welcome! If you haven’t visited this part of Ireland before, this is your chance! Registration evening on Thursday 2nd May will include a Camino information session with CaminoWays.com experts.